This is an easy Christmas cookie recipe that family and friends will love. It is a bar cookie recipe. The chopped gum drops create a stained glass effect that looks festive and tastes yummy. Grease a 9"x9"x2" baking pan very well and set it aside. In a mixing bowl, beat the eggs until foamy. Beat in sugar and vanilla. Sift together the whole wheat flour and salt. Mix in the gumdrops and chopped nuts. Add egg/vanilla mixture to flour mixture and blend well. Spoon mixture into prepared baking pan. Spread the mixture evenly to all sides. Bake for 30 to 35 minutes (do not over bake). The top will slightly crack, but the inside will still be moist when done. Cut into squares while warm. Cool. Remove from pan when the cookies have cooled. 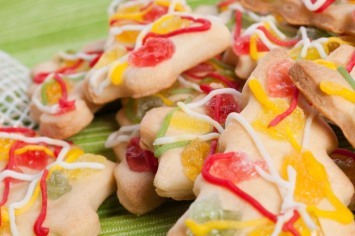 Replace the gum drops with chopped red and green glace cherries for another festive look. If you want regular cookies, like the image above, rather than bar cookies, simply place the dough by the tablespoonful on a cookie sheet. Press down a bit to flatten them a little, then bake at the temperature stated in the recipe for about 12 to 14 minutes until crispy. Note the the cookie image above shows the gum drops placed on top of the cookie, which you can do instead of mixing them in. Add them on the top before you bake the cookies. I prefer them mixed into the batter. Then you get that lovely chewy surprise when you bit into them. This is a simple bar cookie recipe that has the added nutrition of whole wheat flour, but feel free to substitute white flour if you prefer. Mix and bake exactly the same way, but the white flour may not need sifting. Gum drops are just about my favorite candy, so I love these cookies. Kids – young and older – are sure to love them! Although these bar cookies look great on a plate with other holiday cookies, they really are an any time treat. For more Christmas cookie and other holiday recipes, look here.